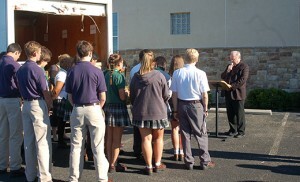 Bishop Dennis Sullivan blesses the students and the food they loaded on the Catholic Charities truck at the agency’s Camden location on Sept. 14. A diocese-wide food relay in honor of Pope Francis transported a donation of food to six food pantries, covering all six southern counties served by Catholic Charities, Diocese of Camden. Students from diocesan high school volunteered at each stop. Monday, Sept. 14, dawned bright and sunny with a crystal blue sky: a perfect day for a relay. But this relay differed in several key ways from a typical athletic event. For one thing, the “baton” was a delivery truck filled with $1,500-worth of donated food. And rather than competing against each another — as they are accustomed to doing on the athletic field — for this event, all six Camden Diocesan high schools were on the same team. The objective: transport a donation of food to each of its six food pantries across Southern New Jersey in a single day. The manpower: volunteers from all six diocesan high schools. The day began with an opening ceremony at Catholic Charities’ Camden office. 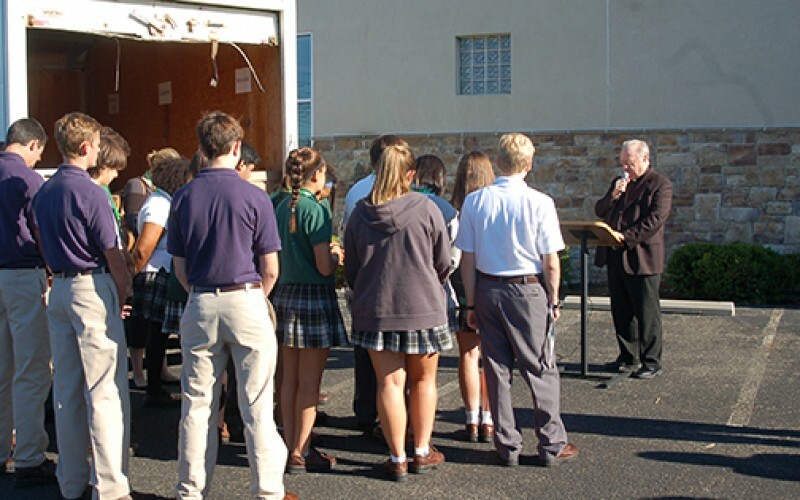 Students from Paul VI, Haddon Township, and Camden Catholic, Cherry Hill, helped sort food and load it into the delivery truck in six equal piles: one for each food pantry the truck would visit that day. 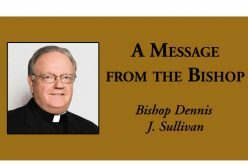 They were assisted in their efforts by Bishop Dennis Sullivan, who blessed the food, the students and the journey as the truck set off. 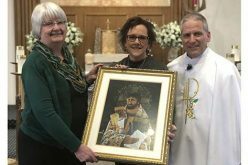 The truck travelled 150 miles, beginning in Camden, then heading to Westville, Penns Grove, Salem, Vineland, Rio Grande and Atlantic City, where it delivered food to the Catholic Charities food pantry in each location. At every food pantry, volunteers from a different diocesan high school greeted the truck and helped unload the food: Gloucester Catholic; Camden Catholic; Paul VI; St. Joseph, Hammonton; Wildwood Catholic; and Holy Spirit, Absecon, respectively. 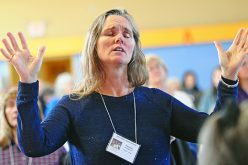 The purpose of the journey was to raise awareness for the extent of hunger throughout South Jersey, where 190,000 people, or 40 percent of the region’s total population, suffer from food insecurity. It also provided an opportunity for Catholic Charities and diocesan high school students to come together in service in honor of Pope Francis’ visit. The donation of food was provided by Grimley Financial Corporation, a longtime supporter of Catholic Charities. 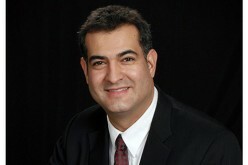 “We see charity as an essential responsibility in the corporate world. For 30 years, service has been an important part of our corporate identity, and Pope Francis’ message reinforces our commitment to supporting those struggling in our community,” said Charles Grimley, president and CEO of Grimley Financial Corporation. “We hope to encourage other corporations to embrace the same spirit of giving, as the requisite need has never been greater,” he said. The food will help assist the more than 5,000 people who receive food services through Catholic Charities each year. Ave McFadden is a senior at Holy Spirit High School. She and six other volunteers from the school met the food truck at its last stop at Catholic Charities’ food pantry in Atlantic City. She said she enjoyed the hands-on aspect of the service day and the opportunity to see a food pantry in action. Ave was joined in the food pantry by school principal Susan Dennen and Director of Catholic Identity, Father Jamie King. Both remarked on the way high school students react to Pope Francis. “The pope is on their radar. Pope Benedict spoke in parables; Pope Francis speaks in tweets,” Father King said. As for the service day, he said the service students do year-around is often less tangible than Monday’s food relay and forms an important part of the students’ identity. Each diocesan high school requires students to participate in service. Many students take on extra service without being required. A similar theme was repeated at each stop along the way. 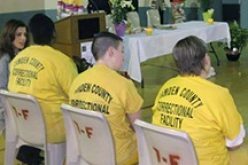 No high school had difficulty finding student volunteers to participate. Volunteers from each school were members of student government groups, participated in the National Honor Society, or were just generally interested in lending a hand.